If you’re thinking of going on a balloon ride or have been given a flight voucher, you probably have some questions to ask before you book your date. 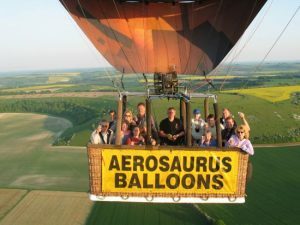 Aerosaurus Balloons have been providing Champagne balloon flights for over 25 years and we understand that it is usually a once in a lifetime experience for most people. Our knowledgeable and friendly team have put together a list of the top 10 most frequently asked questions to help you learn what to expect with your flight. 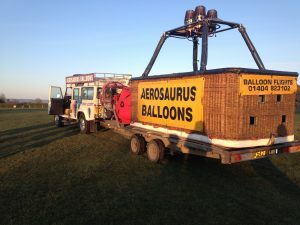 What is involved in the ballooning experience? With Aerosaurus Balloons, you get much more than just a balloon ride. When you arrive at the meeting point, you will be met by the friendly Pilot and Crew who will talk you through the various stages of the experience before driving you to the chosen launch site where you will be given a safety briefing by the Pilot. The balloon will be unpacked and everyone can get involved with helping with the setup and inflation. When the balloon is ready, the Pilot will ask you to get in the basket and take your launch positions. As the balloon leaves the ground you will feel no movement, when you stand up, you will see the ground slowly appearing smaller and smaller. The balloon will fly for approx. 1 hour, during this time you will enjoy views of beautiful countryside, cities, towns and villages (remember your camera!). The Pilot will locate a suitable site to land and will ask you to get into the landing position. Most landings are very smooth and soft but occasionally there can be a bit of bump which is why the landing position is important to avoid falling into one of your fellow passengers! The pilot will tell you when it is safe to get out of the basket and then the ground crew will arrive to help pack away the balloon. Once packed away, you will be served a glass of chilled Champagne to toast the flight before you are driven back to the original meeting point and presented with your flight certificate. Where do you fly from? We fly from various locations across the South West, so wherever you are located, there will be a launch site nearby. 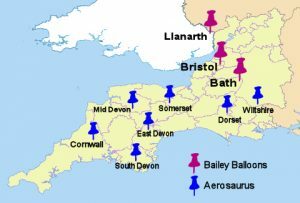 The main launch sites are Launceston in Cornwall, Ivybridge in South Devon, Exeter & Tiverton in Mid-Devon, Taunton & Castle Cary in Somerset, Sherborne & Shaftesbury in Dorset and Larmer Tree Gardens and Salisbury(Aug – Oct) in Wiltshire. We can also arrange private flights to launch from your own land (subject to suitability) and we have agreements with some hotels such as Bovey Castle and Thornbury castle to launch a private flight for guests from the hotel grounds. Can anybody fly/are there any restrictions? We do our best to accommodate everyone, however due to the nature of the activity, there are some exclusions. 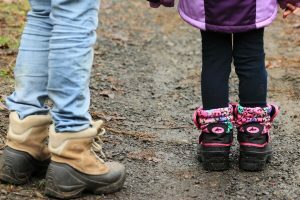 The minimum age for children is 7 years and we suggest a minimum height of around 1.25m. There is no upper age limit as long as the person is fit and healthy. We cannot fly anyone who is pregnant, recently had surgery or has osteoporosis. Other medical conditions should be brought to our attention so that we can decide if the activity will be suitable. Can we fly over Stonehenge? Unfortunately, Stonehenge has restrictions in place so we cannot fly directly over it, however, it can often be seen in the distance from some of our Salisbury flights. There is no particular dress code for ballooning, however, we suggest that you wear comfortable clothes and sensible shoes. The temperature in the balloon is around the same as it is on the ground, we travel with the wind so there is not much breeze and you get some heat from the burners. Due to the times of the flights, we suggest you bring extra layers for before/after the temperature when the temperature is cooler. We usually land in a field so walking boots/trainers are best and a hat is useful for protecting a bald head from the burners heat! Why do I need to call the weather line? Ballooning is a very weather dependent activity and therefore it is essential to call the weather line at the time specified for your flight so you can listen to the final update from your Pilot. The weather in Britain is very changeable and unpredictable so we leave it as late as possible to make the final on/off call to ensure that we make the correct decision based on the latest available weather updates from the MET office. It is also important to call the weather line to check for any changes in meeting times as sometimes the conditions may require us to bring the flight forward or wait a little while for conditions to clear up. Even if it looks like a perfect day outside, there can be conditions that make it unsafe for ballooning so always check before you leave to avoid a wasted journey. The weather today was nice so why was my flight cancelled? Our pilots are very experienced balloonist and have access to a dedicated balloon forecasting service with the MET office. There are lots of different factors that the Pilots have to look at when deciding whether it is safe to fly, the main areas are wind speeds, rain, visibility and risk of storms. Wind speeds and directions vary at different altitudes, so they look carefully at the ground speeds and speeds on the gradient (1000ft). If we have a particularly low jet stream, we can have a lovely still day on the ground but it can be really gusty on the gradient which can make it very dangerous for balloons. 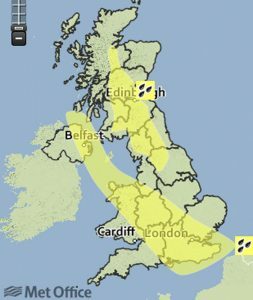 We are also unable to fly if there is a risk of thunderstorms in the area or low visibility due to mist or fog. Our passenger’s safety is our top priority and we may cancel flights when we are uncertain about the conditions, where other companies may take the risk – it is much better to be on the ground wishing you were flying than to be in the air wishing you were on the ground! You can read more about the weather in our blog – What is the best weather for ballooning? I’ve chosen a backup date, what happens if my first flight is postponed due to unsuitable weather? What happens if I don’t fly before my voucher expires/I’m only available for one date? If you have been unlucky with the weather on the dates you have booked your flight and your voucher is due to expire, it can be extended to allow you more time to fly. If you have had 5 or more flights cancelled by us because of the weather, we will extend your voucher free of charge. If you have had less then 5 attempts but want to keep trying, you can pay an extension fee to allow you more time to book. Other circumstances such as pregnancy and medical reasons need to be considered individually so you must contact us with confirmation of your condition as soon as you are aware that you are unable to fly. If you are looking to fly on a specific date or are only visiting the area for a short time and will not be able to reschedule if you are cancelled, you can purchase our refundable voucher or talk to us to discuss the options! How big is the basket and how do I get in it? We have various sized balloons and baskets that we can use. For our groups’ flights, we will usually have the largest basket which will take 15 – 16 people plus the Pilot. 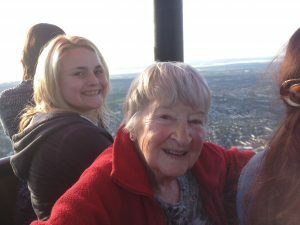 The basket is divided into compartments with 3 – 4 people in each and the Pilot is in the middle, this means everyone gets a great view around the edge and can chat to the Pilot easily. Our smaller baskets are usually used for private or exclusive flights and can vary between 2 – 10 people. The baskets are all around 1m high and have foot holes in the sides to help with getting in and out – it is like climbing over a 5 bar gate. If you have a voucher with us or are thinking of booking, you can view our full list of frequently asked questions on our website or feel free to call or email us, our friendly office team are always happy to answer any questions you might have!